Windows 10 Mobile will be launched in late September, according to reports. Microsoft has already confirmed the launch of its Windows 10 OS for July 29, however it has not confirmed when the other editions will arrive. The successors to Windows Phone 8- Windows 10 Mobile and Windows 10 Mobile Enterprise are widely expected to ship in the next few months. According to Neowin, a Microsoft spokesperson has revealed the September launch date during a presentation to the company partners. The slide stated that both the enterprise and consumer versions of Windows 10 Mobile, should become available “late next quarter”, that would be the end of September. 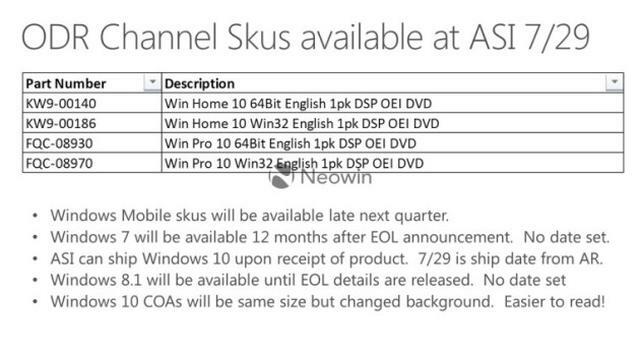 Microsoft says that “Windows Mobile SKUs will be available late next quarter". However, the Microsoft spokesperson also stated that the launch could occur in October, too. This launch date is meant for OEMs and partners for doing account carrier testing, update cycles and so on. The regular user may have to wait for much longer depending on the network carrier and location. Devices running the latest OS may start coming to the market from October. Microsoft has stated that for updates to Windows 10 on mobile devices, the company is no longer going to rely on carrier delivery. The company stated, "Here at Microsoft, we take our responsibility to keep Windows secure seriously. And today, we’re announcing this continuous update process applies to all Windows 10 devices, including phones." Microsoft has announced the launch of its Windows 10 OS on July 29. Windows desktop users have already started getting prompts to reserve their free upgrade to Windows 10 OS. The company had confirmed that the OS will launch on Mobile, Surface Hub and Microsoft HoloLens a few months after that. The software giant had stated that Windows 10 will be the last standalone desktop OS from Microsoft. Windows 10 OS will come preloaded with Voice assistance Cortana, a new browser- Microsoft Edge and Windows Defender anti malware protection. The new build brings new music, photos, calendar and more apps to users. Microsoft states in a press release, "From the return of the Start Menu to the variety of innovative features, Microsoft created a more personal, fun and productive Windows experience".